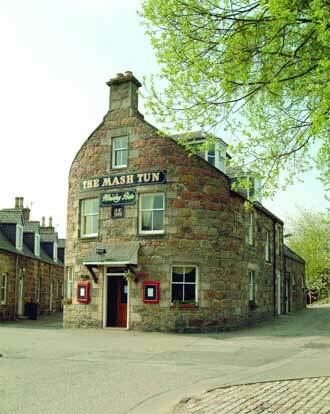 The Mash Tun enjoys a scenic location overlooking the fast flowing River Spey. Four first-class rooms and hundreds of rare malt whiskies. If your passion for high-quality lodging is equaled only by your passion for fine Malt Whisky then you'll love this place. Situated in Central Aberlour, just yards from the Speyside Way, this former railway boozer has been transformed into a luxury bed and breakfast. The Whisky Bar has featured in several BBC walking and nature specials over the years and has one of the biggest collection of single malts and blends in the area. Check out the Family Casks - which is a unique selection of nearly 50 single cask whiskies, with one for each consecutive year from 1952 to 1997. They also have the biggest collection of Glenfarclas Casks in the world (there's also some tasting sessions, so connoisseurs take note). The property has four luxury (and whisky-themed) bedrooms on offer: The Glenfarclas, The Glenfiddich, The Macallan and The Glenlivet - all named after famous Speyside malts and all beautifully decorated throughout. There's also a Luxury Suite - The Aberlour. All rooms enjoy terrific views of the River Spey - one of the finest stretches of water in Scotland and popular with fly-fishers and kayackers alike. There is a children's adventure playground outside the hotel and 18-hole putting is available on the adjacent green throughout the Summer. The local Aberlour Distillery is just a 10 minute walk.